Many of you may know that I am a recipe kind of girl. I really like trying new recipes, and generally speaking, I follow them pretty closely. 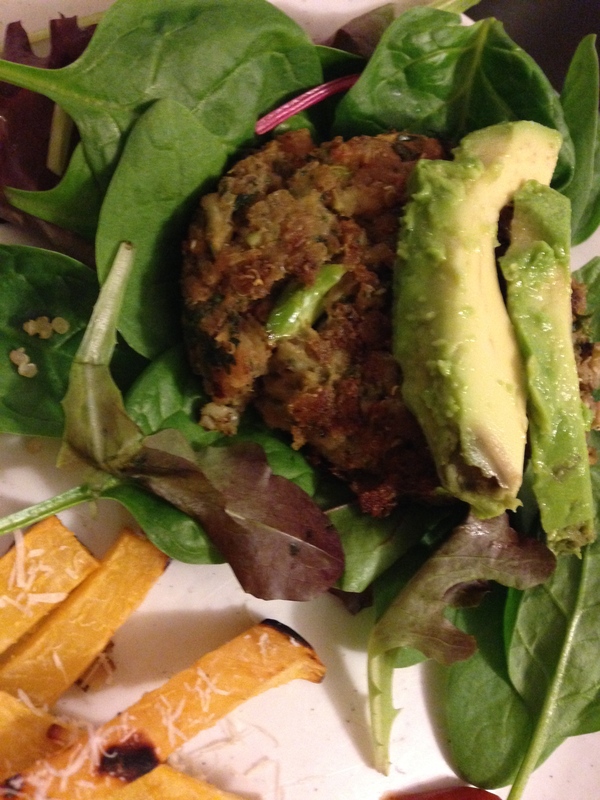 However, I decided to get out of my box, and try to concoct a veggie burger on my own. 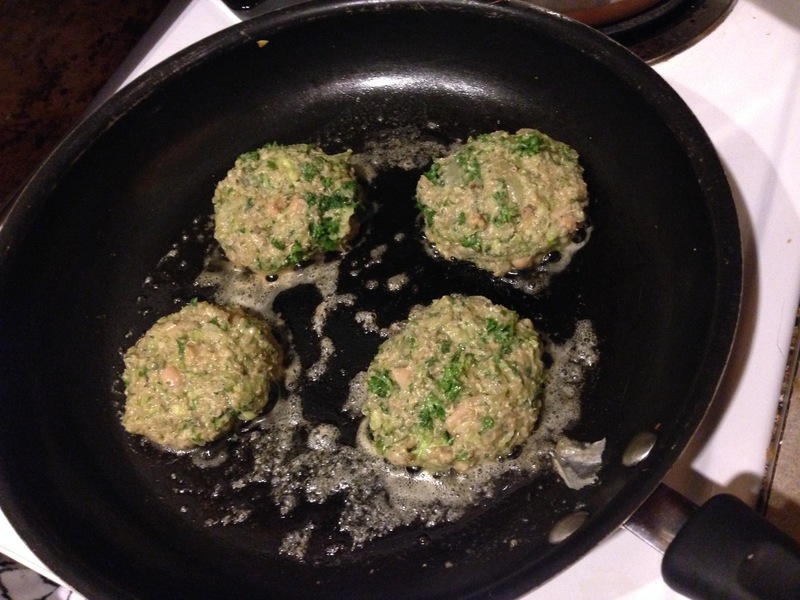 Now, I haven’t made many veggie burgers in the past- recipe or not. I do enjoy them, and I’ve got a bunch of canned beans in my pantry just screaming to be used, so I figured I’d give it a go. I glanced at a few recipes and then decided to wing it. 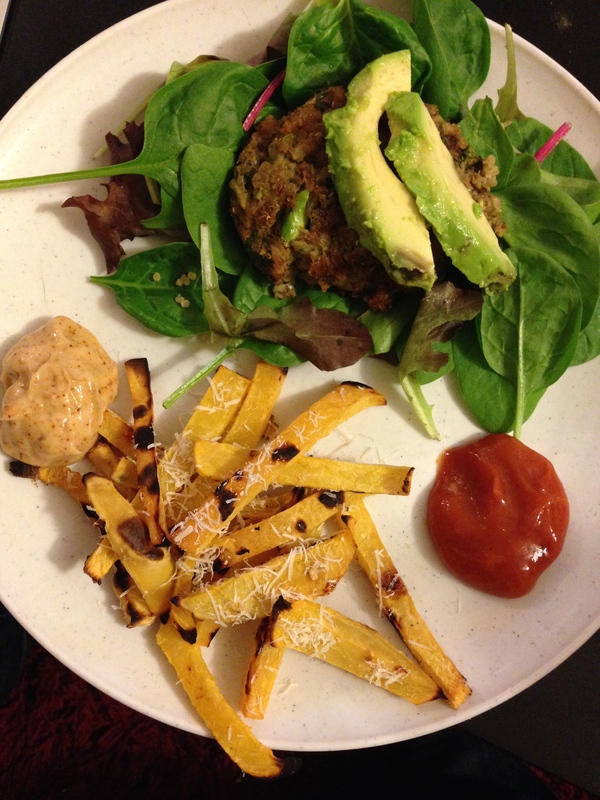 What I came up with was a really fantastic tasting veggie burger. Unfortunately, it was a little crumbly, was a pain to flip, and didn’t quite have the firm texture I was looking for in a veggie burger. But, when I came back to them after they had cooled some, they had firmed up a bit. So, I’m thinking that perhaps I need to chill the mixture before rolling into patties, or they may need a bit more of a binder, like breadcrumbs. Regardless, I figured I’d at least pass along the recipe in case you wanted to try- because I thought the flavors of the patties was SPOT ON. I served mine on a bed of greens with a side of rutabaga fries, and then some chipotle mayo and ketchup. Try it out with your variations and let me know in the comments what you did and if you were successful! In a large bowl, stir together 3/4 the beans and everything but the flour and egg. Then, transfer to a food processor or blender, and blend, until you have a well-blended mixture (almost like a thick bean dip). (You could probably eliminate the bowl part if your processor is good enough!) Fold in the last of the beans, the flour and the egg. Form patties (perhaps refrigerate them, I did not), and then in a well greased fry pan, brown both sides. Then, transfer to a well-greased cookie sheet and finish in the oven (about 15 minutes). 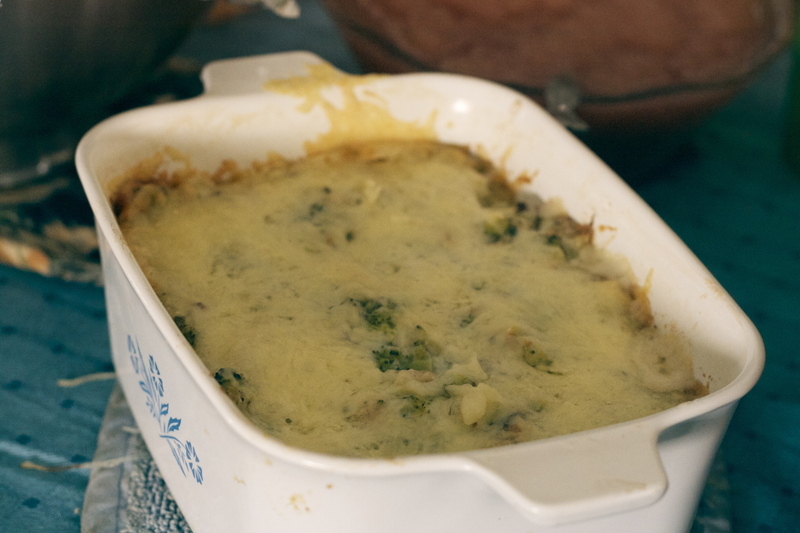 One of my favorite side dishes that my mom makes every Easter is her Broccoli Cheese Bake. It’s one of those cheesy, creamy, delicious dishes that requires just about everything unhealthy: sour cream, loads of cheese, and condensed cream of mushroom soup. But that’s what makes it taste great, right? 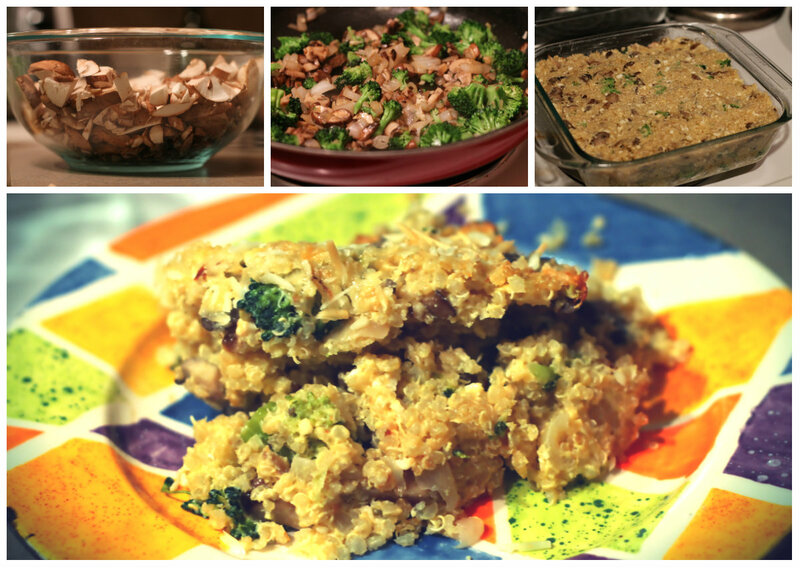 Unfortunately, this year I didn’t go home to enjoy it or any of the other deliciousness that she cooks up 😦 Instead I was here in Tampa, just me and the kitties:-) So, I decided to make a recipe my friend Courtney has been telling me about- a Mushroom Quinoa Casserole from The Best Remedy Blog. 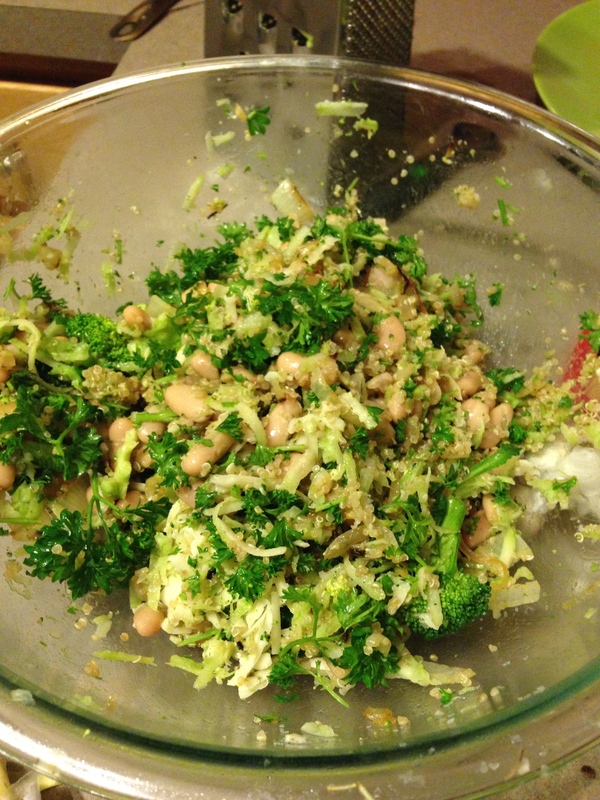 I made a few swaps with the ingredients I had on hand: broccoli instead of kale, and goat cheese instead of sour cream. When it was all said and done, I had a yummy and healthy casserole- which was hearty enough to be a meal in itself, or a great side dish. 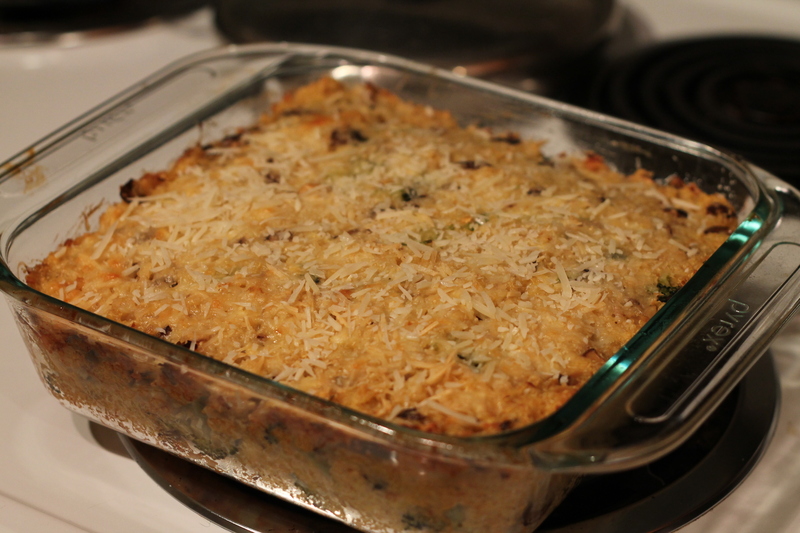 The surprising bonus: it ended up tasting similar to my mom’s broccoli cheese bake! Though it wasn’t oozing with cheese, the flavor was similar and I didn’t feel guilty about loading up on an extra large second helping! 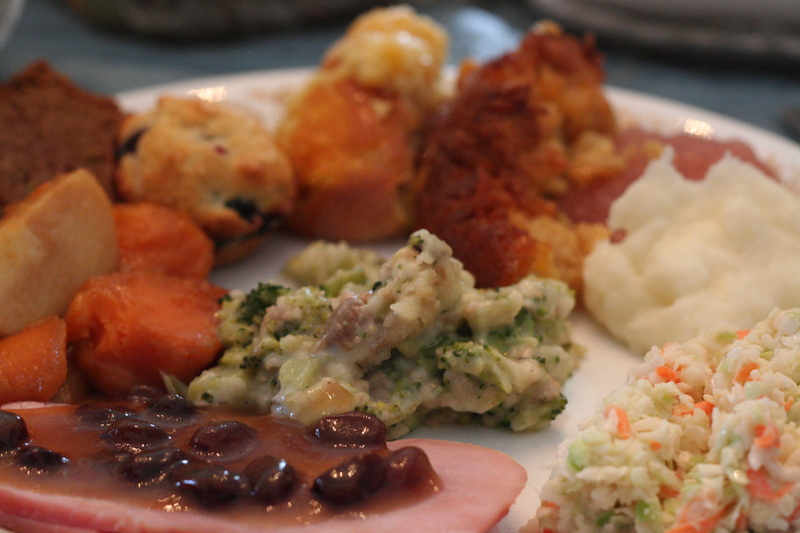 So, if you’re looking for a great side dish for your next family gathering, try this out! Prepare the quinoa. The ratio is typically 2:1 water to quinoa. So in a pot, combine 3 cups water and 1.5 cups quinoa. Turn on the stove and allow the water to start to boil. When it starts to boil, turn the heat down to low and cover. 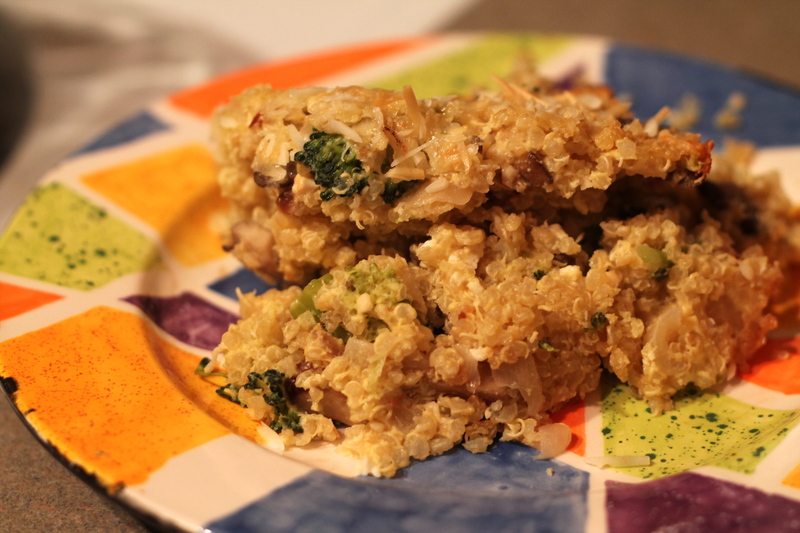 The quinoa should be ready in about 15 minutes. Set aside. Spray a baking dish (I used a 9 x 9 square dish) with olive oil or butter spray and set aside. In a large fry pan over medium heat, heat a tablespoon of butter and a tablespoon of oil. Then saute the onions until they are translucent. Add in the mushrooms and allow them to brown a little and release some of their juices. Stir every minute or so. Add the broccoli, and let it just begin to cook- it should turn brighter green! Stir in the garlic, cook for another minute until fragrant and remove from heat. Add the quinoa to the pan and stir until combined. In a large bowl, whisk together the eggs, cottage cheese, goat cheese, red pepper flakes and salt. Add the quinoa mixture to the cottage cheese mixture and stir until combined. Pour into your greased baking dish. Sprinkle with 2/3 of the Parmesan cheese, cover with foil and place in oven for 30 minutes. Remove foil and bake for another 20 or 30 minutes more, or until it is hot throughout and golden along the edges. Sprinkle with the remaining Parmesan and serve!